USANA, word! : What makes USANA Essentials different? 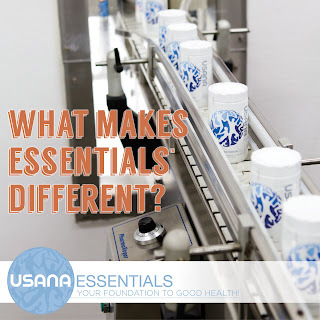 What makes USANA Essentials different? Down the aisles of supermarkets and in the shopping cart of online marketing, you will find a myriad of multivitamin products – from the inexpensive brands that provide vitamins and minerals at bare minimum levels to those that offer advanced nutrition. Sometimes knowing what you are getting can be very confusing, since supplements are not created equal. A simple rule to keep in mind, when choosing a supplement, is that good health should be guarded with utmost security and attention! So what makes USANA Essentials™ Mega Antioxidant & MultiMineral different? 1. A Balanced Comprehensive Formula: Containing full array of vital nutrients including 13 vitamins, nine minerals, 13 phytonutrients, and five supporting nutrients. 2. Broad Spectrum Antioxidant Protection: With more than 20 antioxidants including natural phytonutrients from pure plant extracts. 5. Optimal Nutrient Forms: When compared to six popular multivitamin brands, USANA Essentials MultiMineral provides most minerals in chelated forms. Chelated minerals are minerals attached to organic acid or amino acids and so have better bioavailability. 6. Unique Nutrient Complex: USANA Essentials provides vitamin C from a unique combination of mineral ascorbates, which are less acidic, less irritating to the stomach and retained longer in the bloodstream.2 USANA Essentials provides Olivol™† – an exclusive patented olive fruit extract that offers enhanced antioxidant protection. 7. Advanced Nutrition: Each Recommended Daily Dosage (RDD) of USANA Essentials provides higher total nutrient level and higher levels of many essential vitamins and minerals when compared with the RDDs of the other six multivitamin brands. 8. High Potency: It would require consuming multitudes of RDDs from the other six multivitamin brands in order to obtain the same levels of many vitamins and minerals provided in each RDD of USANA Essentials. For example, it would require five times the RDD from Brand A, or nine times the RDD from Brand B, to obtain the same level of vitamin C contained in a daily dosage of Essentials. How much are you really paying? 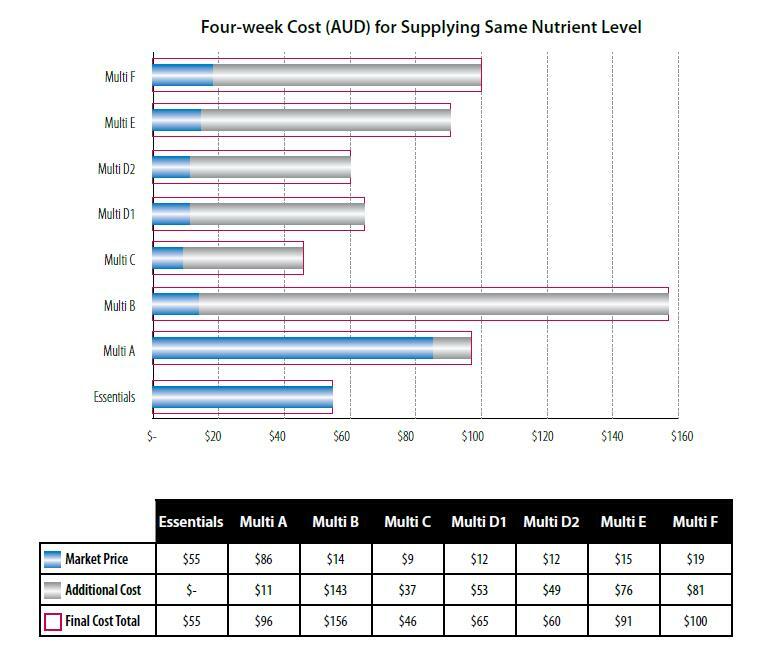 The chart below illustrates the four-week cost for USANA Essentials, as well as for the other six multivitamin brands if the same daily total nutrient level were to be provided in each product. USANA Essentials not only offers nutrients in optimal and absorbable forms, but also provides advanced nutrition at great value. For more information about USANA’s Essentials click here, please log in to enjoy the Preferred Price. † USANA OlivolTM Protected Under US Patents 6,358,542 or 6,361,803.